Submitted photo Patient simulators allow students to monitor vital signs and administer drugs for aeromedical evacuation training by active-duty, reserve and ANG Airmen at Wright Patterson Air Force Base. WRIGHT-PATTERSON AIR FORCE BASE — The School of Air Evacuation is celebrating their 75th anniversary August 2 and 3 at the United States Air Force School of Aerospace Medicine of Wright-Patterson Air Force Base. Lt. Gen. Dorothy Hogg, United States Air Force surgeon general, will kick off the event and provide her perspective of Air Force Medical Service. The 349th Air Evacuation Group was activated during World War II on Oct. 6, 1942 at Bowman Field, Kentucky. Directed by the war department, the 349th’s mission was to train flight surgeons, nurses and enlisted members for air evacuation duties aboard cargo carriers. On February 18, 1943, the 349th graduated their first class of 30 nurses. The graduates participated in a four-week program that included class work in air evacuation nursing, air evacuation tactics, survival, aeromedical physiology, mental hygiene in relation to flying, training in plane loading procedures, military indoctrination and a one day bivouac. On June 25, 1943, the name “School of Air Evacuation” was officially recognized by the Army Air Force. In 1944, the School of Air Evacuation was transferred to be part of the School of Aviation Medicine located at Brooks AFB, Texas, and then relocated to Wright-Patterson AFB in 2011. Following the guest speakers, a “Jenny” dedication will be held to recognize and show appreciation to the first airplane used in air evacuation which was instrumental in prepared the Air Force for the aeromedical evacuation mission. 711th Human Performance Wing commander, Brig. Gen. Mark Koeniger, will be the dedication’s guest speaker. The “Jenny”, a Curtiss JN-4, was the first aircraft deemed as the first air ambulance. At the end of World War I, the United States Army recognized the need to air transport wounded soldiers. In the same year, 1918, Maj. Nelson E. Driver and Capt. William C. Ocker converted a Curtiss JN-4 “Jenny” bi-plane into an air ambulance. The cockpit was modified to accommodate a stretcher and the beginning of aeromedical evacuation was born. Day two will continue with guest speakers followed by a wreath presentation in remembrance of the flight nurses and technicians who have lost their lives in the line of duty. Names of the fallen will be read with a moment of silence. After the wreath presentation, tours of the School of Aeromedical Evacuation will be offered and conclude with the graduation ceremony for students currently attending the School of Aeromedical Evacuation Flight Nurse and Technician Course. “It is an honor to host the 75th anniversary here at USAFSAM, we are privileged to have a diverse group of speakers and events that celebrate the past, present and future of the noble profession of evacuating wounded warriors and bringing them home,” said Miller. 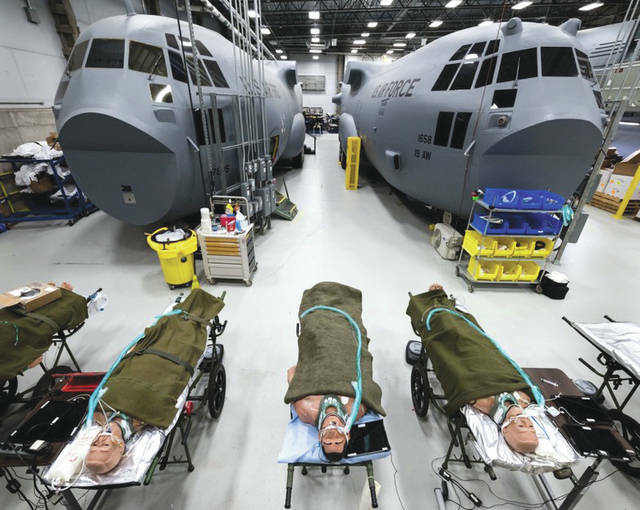 https://www.xeniagazette.com/wp-content/uploads/sites/32/2018/07/web1_airevac.jpgSubmitted photo Patient simulators allow students to monitor vital signs and administer drugs for aeromedical evacuation training by active-duty, reserve and ANG Airmen at Wright Patterson Air Force Base.